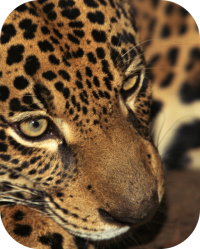 Jaguars are carnivorous spotted large cats that are native to South and Central America. Habitat: Jaguars are found in South and Central America. 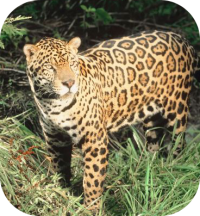 Jaguars can be found in deciduous forests, rainforests, swamps, pampas grasslands and mountain scrub areas. Size: Jaguars are the third-largest living cat species, only the tiger and lion are larger. Size and weights vary considerably. Jaguars stand at 2.25- 2.5 feet at their shoulder and they measure 5.5 - 8 feet from tip to tail. Jaguars weigh between 100-350 lbs. Females are typically 15% smaller than their male counterparts. Diet: The diet of a jaguar constists deer, crocodiles, snakes, monkeys, deer, sloths, tapirs, turtles, eggs, frogs, and fish. Jaguars are ambush hunters, in fact they are considered the best ambush hunter in all of animal kingdom. Description: Jaguars have a large and muscular bodyl that has a heavier and sturdier body than that of a Leopard. Jaguars have a compact body with a broad head. 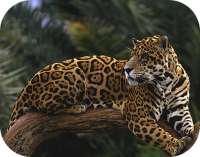 The jaguar's coat is yellow and tan, but the color can vary from reddish brown to black. 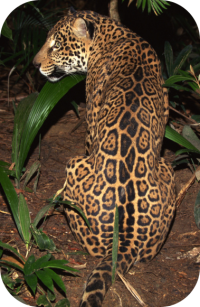 Jaguars have rosette shaped patterns of spots along their side and backs. Behavior: Jaguars have home ranges, a males range is larger than that of a female. A male jaguar's home range is between 19-53 square miles. The female jaguar's home range is between 10-37 square miles. Jaguars mark their territories with urine, and by scratching marks onto trees. Birth: Jaguars have litters with 1-4 cubs. Jaguar cubs weigh 1.5 to 2 lbs at birth. They are born blind and helpless. 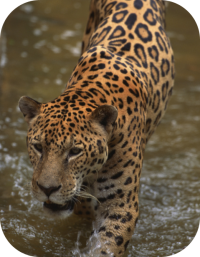 Jaguars are completely at home in the water and are seldom far from a river or lake. Gestation: Jaguars carry their young for 90-110 days. Cubs: Jaguar cubs stay with their mother for 1-1.5 years. The name jaguar is said to come from the the Native American word yaguar, which means he who kills with one leap. Sexual Maturity: Jaguars are considered sexually mature between the ages of 2 to 4. Life Span: Jaguars live 15 to 20 years in the wild and 25 years in captivity. Social Structure: Jaguars are solitary except when breeding or rearing young. Athleticism: Jaguars are excellent swimmers, they can move through the water at surprising speeds, particularly when they are in pursuit of prey. Conservation Status: Near Threatened /Endangered. 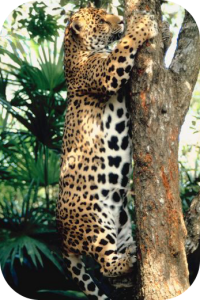 Population Status: There are an estimated 15,000 jaguars remaining in the rainforest.